Bridget Moynahan at the UN Women for Peace Association’s awards luncheon. 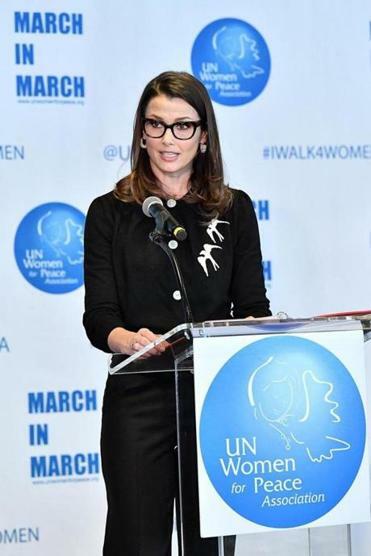 Actress Bridget Moynahan, star of the CBS police drama “Blue Bloods” and a Longmeadow native, served as master of ceremonies at the United Nations Women for Peace Association’s annual awards luncheon in New York. At the event last week, model Ashley Graham received an award for her work as a body activist. The first lady of Panama, Lorena Castillo De Varela, was honored for her role as a global spokesperson for the Zero Discrimination Movement. The UN High Commissioner for Refugees, Sheikha Rima Al-Sabah, and philanthropist Eve Branson also received awards. Moynahan is Tom Brady’s former girlfriend and the mother of his son Jack.